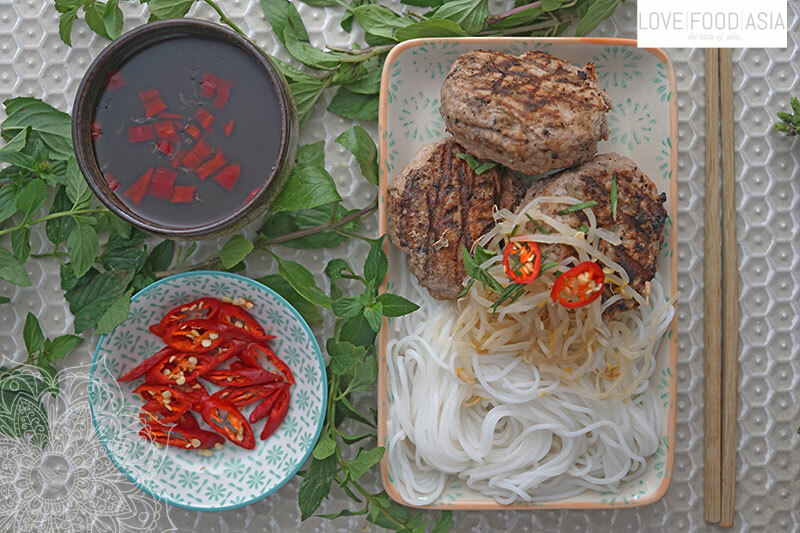 Hanoi Pork Patties (Bún chả) | Love.Food.Asia. Bún chả is a Vietnamese dish of grilled pork & noodle, which is thought to have originated from Hanoi, the capital of Vietnam. Bun cha is served with grilled fatty pork (chả) over a plate of white rice noodles (bún) and herbs with a side dish of dipping sauce. The dish was described in 1959 by Vietnamese food writer Vu Bang (1913–1984) who described Hanoi as a town “transfixed by bún chả.” Hanoi’s first bún chả restaurant was on Gia Ngư, Hoàn Kiếm District, in Hanoi’s Old Quarter. Bún chả is popular in the Northern region of Vietnam. In the South, a similar dish of rice vermicelli and grilled meat is called bún thịt nướng. Mix all ingredients for the dipping sauce and set aside. In a bowl mix minced pork, palm sugar, fish sauce, garlic, onions and lemongrass and form some pork patties with your wet hands. Use some oil to fry pork patties until golden brown. Meanwhile cook Vermicelli noodles for 2 minutes. Place noodles on a plate and put fried pork patties on top. Garnish with bean sprouts and fresh basil leaves. Serve with dipping sauce.